The classic American favorite taste so much better with fresh ingredients. 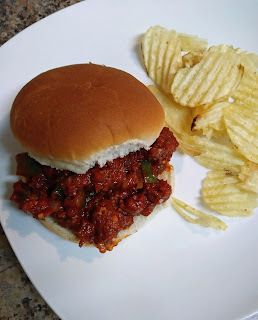 This sloppy joes will have your gang coming back for more. So good. In large skillet over medium heat, add ground beef, crumble meat, add onions, green bell peppers, salt and pepper. Cook about 10 minutes, until no longer pink. Drain off excess liquid. Add remaining ingredients, except sandwich buns. Simmer 10 to 12 minutes, until heated through. Remove bay leaf. Spoon meat mixture onto sandwich buns. There is nothing better than a sloppy joe! And, I love your easy recipe! This is a perfect dinner idea for ANY night, but especially when it's chilly outside! Looks so good! Aw! Glad this brought back good childhood memories.